Hilary Boyer and Donna Benavides at the 2018 ACOG Meeting. ICP Care’s volunteer based 501(c)(3) nonprofit charity is looking forward to attending several healthcare professional conferences and meetings in 2019. This month we will be at the SMFM’s (Society for Maternal-Fetal Medicine) 39th Annual Pregnancy Meeting from February 13 – 15, 2019. We are excited to represent all of the ICP Care Community members again this year to be the voice of each one of you. 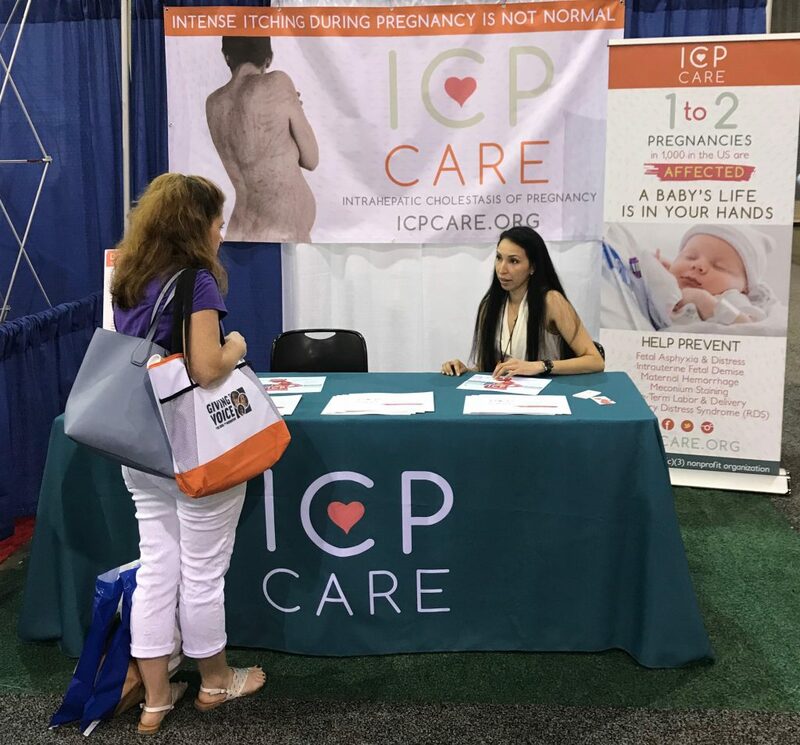 Our educational booth provides Healthcare Provider brochures and materials with the research-based information to help them recognize the symptoms of ICP, diagnose the condition, and treat and manage an ICP pregnancy. Many healthcare providers are becoming aware of ICP Care 501(c)(3) nonprofit by having presence at these conference meetings. The healthcare professional Maternal Fetal Medicine specialist, Doctors and Midwives learn of the patient support and educational resources in both English and Spanish to offer their patients. For the upcoming months of May and June we will be present to educate doctors, midwives and nurses at the ACOG (American College of Obstetricians and Gynecologists) Annual Clinical and Scientific Meeting, ACNM (American College of Nurse-Midwives) Annual Meeting and AWHONN (Association of Women’s Health, Obstetric and Neonatal Nurses) Conference. We would not exist or grow without each volunteer and ICP community member! This support makes this organization possible. Thank you for the continued encouragement allowing ICP Care to further our mission for all ICP babies to be born safely! The participation and involvement of the ICP Community with fundraisers, donations, and joining our events to raise the money allows ICP Care to have a booth at each of these educational meetings! We couldn’t do this without your assistance and contributions! Amparo Healey (Volunteer Spanish & Postnatal Mgr) answering questions at the 2018 ACNM Annual Meeting.